Above: Photo of EverSafe’s Liz Loewy (right), with Laurel Sykes, Montecito Bank & Trust and Ronald Long, Wells Fargo Advisors. 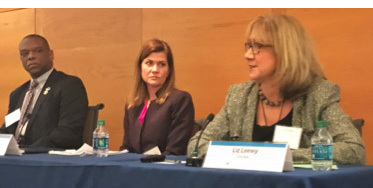 Last month, EverSafe presented at a conference in Philadelphia that brought together financial services professionals, regulators, and aging professionals to discuss “Aging, Cognition, and Financial Health.” The event, co-hosted by thePhiladelphia Fed and the Penn Memory Center at the University of Pennsylvania, focused on a number of issues including the startling lack of official information-gathering pertinent to elder abuse and exploitation, the relationship between diminished capacity and financial acumen, as well as ways fraud and risk tools can be enhanced to detect fraud in later life. The conference addressed timely and important challenges, given that approximately five million Americans are currently living with Alzheimer’s disease. On December 5th, the Senate Banking, Housing, and Urban Affairs Committee voted 16-7 to approve the Senior Safe Act which will serve to encourage financial advisors, investment advisors, insurance companies and depository institutions to report elder financial exploitation without violating privacy laws. The Committee reviewed the Act as part of its markup of The Economic Growth, Regulatory Relief and Consumer Protection Act (S.2155). The next step is for S.2155 to be considered in the Senate in early 2018, followed by a vote in the House and then if it is passed, the Senior Safe Act would become law as part of this larger banking regulation bill. The Senior Safe Act is based on an initiative in Maine that included educating financial services professionals to be more vigilant in identifying signs of fraud and exploitation when interacting with senior clients. Of course, a number of states currently have statutes mandating that professionals at financial institutions report suspected elder financial abuse—click here to learn the reporting requirements in your state. An older couple living in Queens, New York was recently scammed for more than $20,000 in a scheme known as the Grandparent Scam. The victims received an urgent phone call from an individual claiming to be an attorney who was representing their grandson after a car accident. The scammer informed the couple that legal fees had to be paid, and directed them to send gift cards purchased from the retail store Target. Once the couple realized that they had been conned, their efforts to obtain a refund were unsuccessful. Target now has a Fraud Prevention Page and other retailers are beginning to post signs in stores warning of gift card scams. 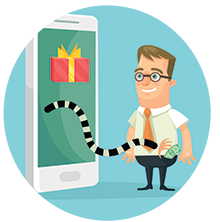 Family members and clients should be educated about this scam, with a caveat that any professional who requests payment via gift cards should be viewed with suspicion. Monitoring statements—Consumers should keep a close watch on bank and credit card statements to identify fraud as quickly as possible. Now in its 15th year, the What’s Next Boomer Business Summit will take place on Wednesday, March 28th in San Francisco during the annual American Society on Aging conference. The Summit, produced by Mary Furlong and Associates, brings together Fortune 100 companies, leading startups, and established nonprofit organizations who are innovating in the longevity marketplace to meet the interests and needs of the aging baby boomer population. Registration is now live! Reserve your seat at: www.boomersummit.com.